Hello all I've never really had a garden before this year except maybe some tomatoes and chiles so I am lost a little bit when it comes to certain things I planted 2 potato bulbs I came across and I think it's sprouting. Today I seen a green stem pop out of the soil and it looks almost like a really thick baby weed but I know it's not a weed and it is about where I planted my potatoes. Does it sound right to you guys, is it my potato? Can you guys give me a description on what it's suppose to look like. Also I was wondering how many potatoes grow out of one bulb is it just one per bulb like an onion or will there be multiples? One more thing how do I know when it is time to harvest my potatoes and onions? Thanks in advance for your input. I appreciate it much. Potatoes are stem tubers and you should get about 10 to 1. 10 pounds for ever 1 pound planted. They produce new tubers above the seed potato, so hilling up is recommended. Click on this link below and do a Search the Forum for more information. The potato plants are thick stemmed and pretty looking once leafed out. So you can see what DDF was talking about, the tubers (that is the potatoes you want) grow under ground but ABOVE the seed potato piece you started with. So you have to give room for that to happen. I am growing potatoes for the first time this year, in a large container. I planted the seed potatoes near the bottom of the container. As the vines grew, I just kept adding soil, til the container was full. You could do the same kind of thing, just by putting a cylinder of something (sheet metal, window screening, whatever) around each potato plant. As the plant grows just keep filling in the cylinder with more topsoil. If you do not have extra soil you can use several things to cover the stem and promote tuber growth. Straw and leaves are commonly used to create "hills" for the tubers to grow in. Hilling with dirt by digging trenches on each side of the row helps keep the soil loose, making it easier to dig the tubers out. Don't do like I did my first year and plant in a trench and back fill with heavy clay soil. Digging tubers out of gooey clay 8-10 inches down was a nightmare. rainbowgardener wrote: I am growing potatoes for the first time this year, in a large container. I planted the seed potatoes near the bottom of the container. As the vines grew, I just kept adding soil, til the container was full. I did this last year in potato grow bags with Russian Banana fingerlings but it didn't work the way I expected. I put the seed on about 2 inches of soil in the bottom, then kept adding more soil as the stems grew up until the entire bag was filled. When I harvested them all of the little fingerlings were at the very bottom of the bag. There were no roots or potatoes at all along the stem and there wasn't much room for the potatoes to grow down at the bottom. I wonder if this is just the case with fingerlings. I made a mistake in choosing this type of potato since it needs a longer season so most of the fingerlings were really small. This year I'm trying again with an earlier season regular type, purple potato, starting them on top of 6 inches of soil, buried them deeper and plan on hilling to the top of the bag. Almost all of the potato varieties that you can easily get your hands on (Red Pontiac, Yukon Gold, etc) have been developed to grow their tubers in a standardized mechanized "hill" of a certain width and height, so it would be very unusual for them to produce tubers where they are not supposed to. Some, but not many, varieties produce tubers on longer runners, which cause farmers trouble with poisonous green potatoes sticking out of the hill. Thank You all sooo much all this info was so very helpful I had no Idea how to grow or harvest potatoes and honestly didn't think they were gonna grow when I planted them it was an experiment I think only one of the potato seeds is gonna grow cause my black lab puppy chewed on the other one a little bit so the stem broke off.LOL! Any way I guess I'm gonna go down to the nursery and buy a plastic planter I'm a cut out the bottom and use the planter as the cylinder. So I have one more question how long do they take to grow usually when and how do I know when to harvest them? How many months do they usually take to grow to their fullest? Thank you so much for all the great info and photos. You can start harvesting new potatoes, about a week or so after blossom stage. Just dig down and pluck a few. Don't get to greedy you won't have many large tubers later. Wait until plants die down to harvest the rest. - insufficient moisture: Keeping the soil/mulch moist all along the stem promotes tuber formation. This is why it's critical that potatoes are planted in well drained location (or if using containers, with plenty of drain holes and using well draining medium). Otherwise, the effort to keep the upper area moist will drown the ones on the bottom. - insufficient time: You said it was a longer maturing variety. 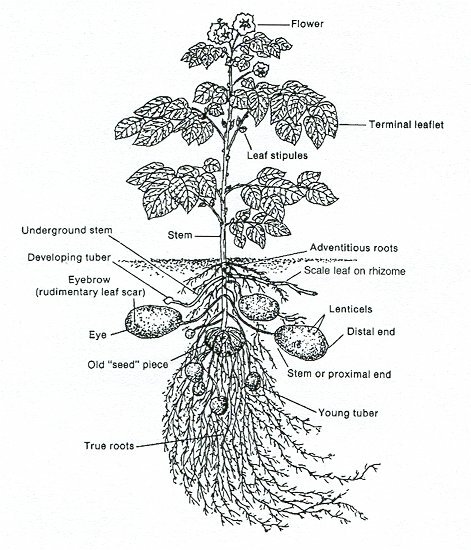 The tubers mature from bottom-up. You may not want to call it quits on the one your dog chewed off. I have seen them come back 3-4 times in a one year after something like that. Also I was wondering how many potatoes grow out of one bulb is it just one per bulb like an onion or will there be multiples? A potato tuber has several eyes. Each eye is capable of sending up a stem. If you plant the whole tuber, you may get from one to fifteen, or more, stems. When you hava a large number of stems growing in such close proximity, you get loads of new tubers, but they will mostly be small because of the competition. On the other hand if you cut the potatoes to one or two eyes per piece, you will get one or two stems from each and they will produce much larger tubers. You may get several tubers per stem. In spite of all that has been written about covering potatoes up over and over, you only need to hill them one time. Wait until they bloom then pull 3-4 inches of soil up around the plant. The reason for doing this is so that as the tubers develop, they won't come out of the ground and turn green in the sunlight. I reckon there are as many ways to grow a potato as there are people doing it. If you stick with it long enough, you will one day have your own style. In the meantime, you may go nuts trying to sort it all out. jal_ut wrote: In the meantime, you may go nuts trying to sort it all out. This goes for vegetable gardening in general. Not just for potatos. And truer words have never been spoken. PS - Search for "potato tower". There's great info in those threads as well. I'm growing mine potatos in one of those. This is my first year to try them and after a slow start, 8 out of 9 potato chunks have sprouted and are growing! angel, as jal stated theres lots of ways to have potatoes. The good thing i have found is that they are one of the hardiest little critters in the garden. they seem almost impossible to kill or not get to grow. I hill mine one time and have had excellent luck doing it this way. i normally dig mine once the plants have died telling me "their done". to me the potato is about the easiest keeper in the garden. good luck and happy gardening! This year I really wanted to try to grow potato because I saw a post from Jal w/ his success. I found out I was pregnant and doctors orders were no bending, lifting etc etc.. (long story) any who Ã¢â‚¬â€œ I posted a while back about growing potatoes in straw  I donÃ¢â‚¬â„¢t know if itÃ¢â‚¬â„¢s working but the plant (now plants) continue to pop thru the straw which means I throw more straw on top of them. I canÃ¢â‚¬â„¢t believe how tall the plants are growing, IÃ¢â‚¬â„¢ll need to find the post and update it again. Side note: This is AWESOME when it comes to working w/ my 4 yr old. She LOVES when itÃ¢â‚¬â„¢s time to do the straw. She grabs a big chunk and loves that we have to water it down.